Butterflies like sunflowers for their nectar, but this plant also serves as the larval food for the silvery checkerspot and bordered patch butterflies, according to William Cullina, author of the New England Wild Flower Society Guide to Growing and Propagating Wildflowers of the United States and Canada. Heavily seed-laden sunflower heads continue to arouse interest later in the year when many birds visit in the fall and winter, including chickadees, blue jays, goldfinches and nuthatches. Of course, to some creatures like deer, a young sunflower plant is a nice treat and the whole thing gets gobbled up. So if you live in deer country, either get ready to share or take precautions by spreading blood meal or some other safe repellant if you want the plants to grow up to flower. If flowers can evoke different emotions, then I think sunflowers take care of bringing on cheer. They reach up high and produce large, bright flowers that resemble the sun, hence their genus name of Helianthus — Greek for “sun” (helios) and “flower” (anthos). Sunflowers are fairly versatile; height varies, as does soil and lighting preferences. There are many species native to Canada. 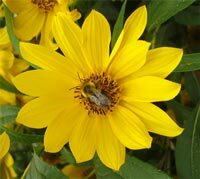 According to many sources, they include the annual Helianthus annuus, reported to be one of the first crops grown in North America. This species was later introduced abroad and piqued sufficient interest to create a huge oil-making industry in the former USSR, where millions of acres are still devoted to growing sunflowers for the production of sunflower oil. The sunflower also got the attention of Vincent Van Gogh, who captured its beauty on canvas. Vincent wrote in a 1888 letter to his brother Theo: “I am hard at it, painting with the enthusiasm of a Marseillais eating bouillabaisse, which won't surprise you when you know that what I'm at is the painting of some sunflowers ... If I carry out this idea there will be a dozen panels. So the whole thing will be a symphony in blue and yellow.” One of these paintings is now reputed to be worth $30 million! Sunflowers are large plants with some species growing up to eight feet in ideal conditions! They are part of the composite family as their flower heads are really made up of many ray flowers (the centre parts) and disk flowers (attached to the petals). Only the disk flowers are fertile and are capable of producing seeds. There is variation from species to species, but one typical characteristic includes leaves that are widest at the middle or base, giving it a pointed look near the outer tip. Flowers have yellow petals with either yellow or dark brown centres, although new varieties include petals that resemble the colour of a rich red wine. The perennial species typically have a more delicate look than their annual cousins. Raw sunflower seeds of H. annuus are nourishing and tasty, and are eaten by both people and birds. They contain vitamins E, B1 and B5, and several important minerals. In fact, according to the website The World’s Healthiest Foods, a quarter cup of sunflower seeds contains 90 per cent of our daily requirement of vitamin E. This is good news for those who like to munch on these seeds as a snack, as this vitamin prevents free radicals from wreaking havoc in our bodies, thus helping to prevent many diseases. Its anti-inflammatory qualities are said to help to alleviate symptoms of conditions such as arthritis. 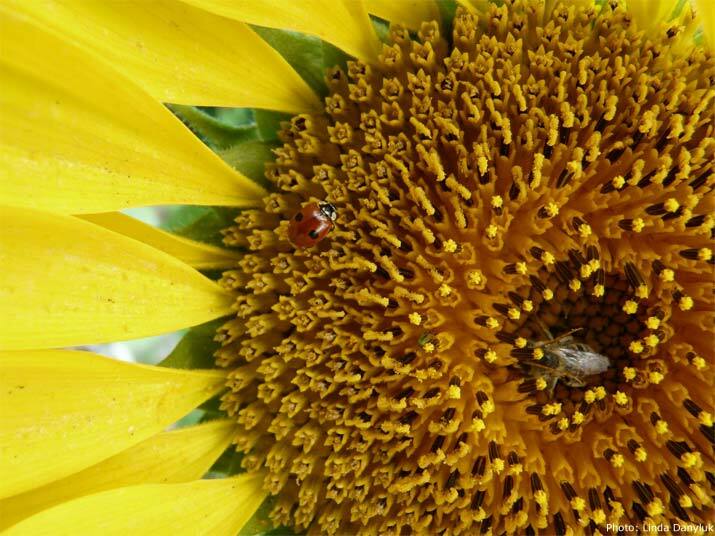 Sunflower pollen appears to be another great food that is high in amino acids, vitamins, minerals and good fats. My daughter and I have fun indulging in the free nutrients that fall from the sunflower bouquet at our dinner table by licking our fingers and then wiping up the treat! A real conversation starter, but we’re not the only ones enjoying sunflower pollen. Bees get busy collecting this very important pollen that they feed their growing youngsters back at the hive. In the case of the late-fall flowering — and aggressively spreading — H. tuberosus, also known as the Jerusalem artichoke, the tubers are edible and support the health of our intestinal flora. They can be eaten raw in salads or vegetable juices, or steamed with butter and lemon juice drizzled on top. The different parts of sunflowers are reputed to have many uses, from livestock food to the manufacture of paper, silk and yellow dye. image to see a larger version. Both annual and perennial varieties can be grown quite easily from seed in the springtime. Plant seeds directly in the earth or after an overnight soaking to increase the chance of sprouting success. Perennials can also be grown by dividing in the spring and some spread quickly all on their own. There are even those, such as Allan M. Armitage, author of Armitage’s Native Plants for North American Gardens, who’ve had success propagating from “terminal cuttings in the spring or summer.” If you try this method, you may want to have “deep cuttings with at least three nodes below the ground,” says William Cullina. Some perennial species spread easily, so choose carefully before planting and perhaps surround with an equally pushy plant. Their height, and in the case of many perennials, their bushiness and sometimes floppiness, may warrant planting at the back of a garden where other plants or some string can prop them up. Sunflowers can get mildew, so allow for air circulation. 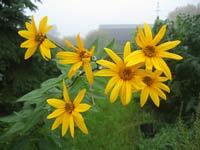 I have seen this happen on H. mollis, one of the smaller sunflowers in CWF’s demonstration gardens. This only seems to happen, however, when we have an especially wet summer and its hairy leaves keep moisture on the plant. Ensuring sufficient sun helps prevent this problem. Habitat: Plains and rich bottomlands. Prefers full sun and dry to moist soils. Appearance: An annual that grows 90 to 300 centimetres and blooms from summer to fall. An aggressive spreader. Native to: Ont., Que. and N.B. Habitat: Streambanks, open woods and thickets. Prefers full sun to partial shade and moist soils. Appearance: A perennial that grows 60 to 150 centimetres and blooms from summer to fall. Native to: Ont. and swQue. Habitat: Woods, thickets and clearings. Full sun to partial shade and moderately dry soils. Appearance: A perennial that grows 60 to 200 centimetres. Blooms from summer to fall. An aggressive spreader. Native to: Man., Ont., Que., N.B. and N.S. Habitat: Clearings and moist thickets. Prefers sun to partial shade, and moist to wet soils. Appearance: A perennial that grows 1.2 to three metres and blooms from summer to fall. Native to: B.C., Alta., Sask. and sMan. Habitat: Dry prairies. Prefers full sun and dry to moist soils. Appearance: A perennial that grows 90 to 200 centimetres. Has small yellow flowers with dark centres and blooms from summer to fall. An aggressive spreader. Native to: sB.C., sAlta., Sask., Man. and wOnt. Habitat: Prairies and plains. Prefers full sun and dry to moist soils. Appearance: An annual that grows to 120 centimetres. 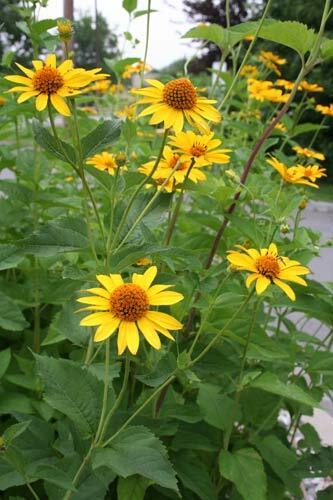 The blooms are seven centimetres across with dark brown centres, and last from mid-summer to late fall. Native to: Ont. and Que. Habitat: Open areas and moist thickets. Prefers full sun to partial shade and moist soils. Appearance: A perennial that grows to 100 centimetres or more, with delicate flowers that bloom in late fall. A very aggressive spreader. Native to: sB.C., Sask., Man., Ont., Que. and N.B. Habitat: Prairies and open woods. Prefers full sun to partial shade and dry to moist soils. Appearance:A perennial that grows 60 to 150 centimetres and long-blooming from early summer to early fall. It can be an aggressive spreader. This plant is different from Helianthus in that both the ray and disk flowers are capable of producing seeds. Ours are visited by red aphids in the early summer, but we remedy this problem by repeatedly spraying with strong washes of water. We also get the help of some hungry ladybugs. The aphids never interfere with the great show this plant puts on each year.